A couple of weeks ago my friend Paul from Florida was in New York. I love showing off my knowledge of the city so on our way to The Morgan Library, I took him on a detour to The Church of the Transfiguration -- better known as The Little Church Around The Corner. New York is full of indigenous architecture -- rows of brownstones, streamlined Art Deco skyscrapers and glass-and-steel office buildings. But what I love most of all, I think, are those little out-of-place gems that belong somewhere else, nestled in among high rises. 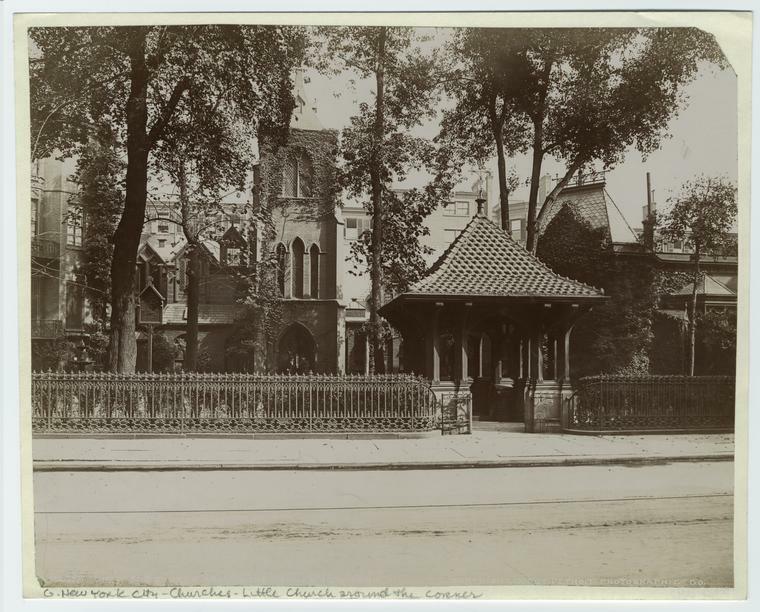 The Little Church Around the Corner is quaint and meandering (it has been said that it grew "like a holy cucumber vine"); its brick and tiled gatehouse luring the visitor into a cast-iron fenced garden complete with statuary and a fountain. It looks for all the world as though it were plucked out of a rural English landscape and dropped intact into Midtown Manhattan. 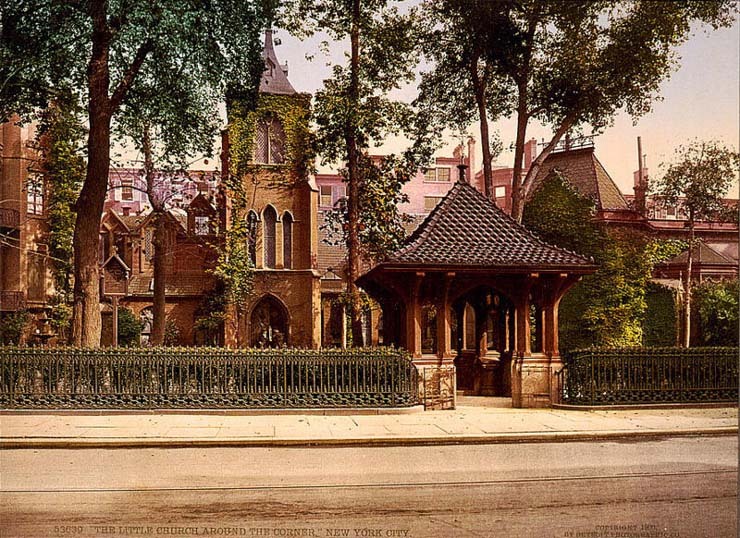 Almost everyone knows how the nickname came to be: in 1870 Joseph Jefferson tried to arrange the funeral for his actor friend George Holland, presumably at Marble Collegiate Church. The acting profession was not considered "polite" in the 19th Century and Mr. Jefferson was advised that there was a little church around the corner "where they do that sort of thing." Jefferson replied "God bless the little church around the corner" and The Church of the Transfiguration at once gained a nickname and the hearts of the acting community. A symbol of constancy, it has had only six rectors since it was built in 1848. And while the church has seen social upheaval -- sheltering escaped slaves during the draft riots of the Civil War and physical change of the city around it (when built it was on the outskirts of the city) -- it exudes an aura of peaceful tranquility. With art ranging from sixteenth-century Flemish panels to Victorian sculpture to contemporary additions, the church is as much museum as place of worship. One of my favorite windows was donated by Jefferson, who was responsible for the nickname. Jefferson was famous for playing Rip Van Winkle and in this window, the actor is dressed as that character escorting his friend George Holland to his burial while Christ, newly risen, greets them. Totally out of place and totally charming, The Little Church Around the Corner is a must-see for any New Yorker or visitor.